If you love Destin from the ground wait until you see it from 800 feet above the Gulf of Mexico! 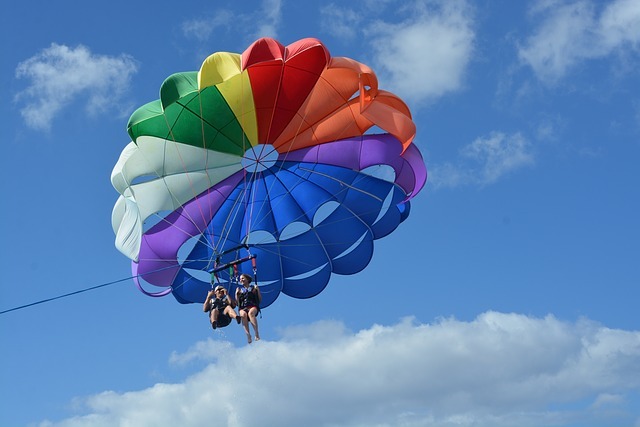 Parasailing is one of the top activities in Destin as you can tell from the many parasailing companies to choose from. Many offer online reservations, coupons and other activities for the hesitate family member. You can fly single, double or even triple – no more experiencing the adventure alone. You will not get soaked but you do want to wear your swim suit so you can enjoy the dip in the warm water of the Gulf during your flight. You will board the boat form the docks, be fitted with life jacket and lift off from the flight deck up to 800 feet! The flight will last approximately 15 minutes. Destin’s crystal clear water makes viewing the marine life from above truly a one of a kind experience. Not a fan of heights? Stand Up Paddle Boarding has become very popular in Destin. The Emerald Gulf Coast offers the perfect floor for paddle boarding with few waves and calm waters. Many local board shops will allow you to rent a board and some offer lessons. Every Sunday in January and February at Norriego Point in Destin, FL, WET Inc offers Stand Up Paddleboard (SUP) DEMO DAYS. You can try out the different SUP types and models to compare and determine which paddleboard is best suited for you!